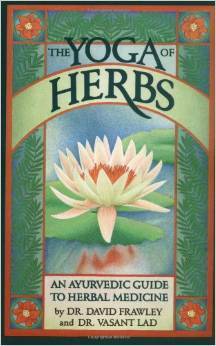 Yoga of Herbs: An Ayurvedic Guide to Herbal Medicine| Author: David Frawley and Vasant Lad | Foreword: Michael Tierra | List Price: $15.95 | Pages: 288 | Type: Paper Back | ISBN: 0941524248 | First Published, 1986, new edition 2001 | Editions: USA, India (Motilal Banarsidass), Germany, Russia, France, Italy, Spanish, Holland, Japan, Czech Republic. YOGA OF HERBS contains many of the most commonly used western herbs with a profound Ayurvedic perspective, explaining their energetics according to a deeper yogic vision. Important Chinese and special Ayurvedic herbs are also introduced from the same point of view. Beautiful diagrams and charts, as well as detailed glossaries, appendices and index are included. The book helps you understand to use hundreds of herbs according to the ancient wisdom of Ayurvedic medicine and its yogic insight. The most widely used Ayurvedic Herbal in the western world for the past more than twenty years and the sole collaboration of these two important Ayurvedic teachers, who have thousands of students throughout the world. Preview on-line through Google Book Search.